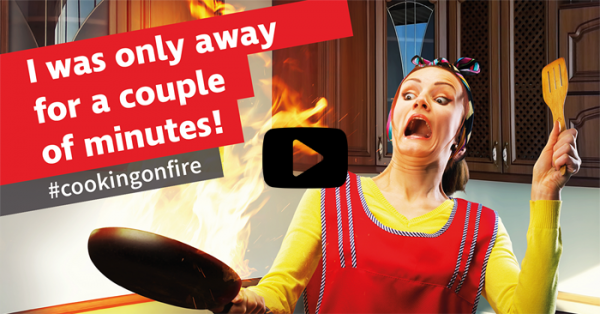 Did you know a house fire doubles in size every 30 seconds? 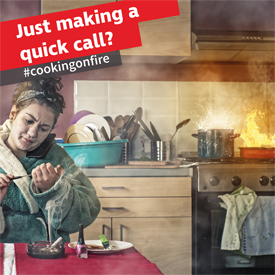 That 1 in 3 people rescued from house fires in Oxfordshire are rescued from a cooking fire? Do you really want us to join you for dinner? Distraction is one of the main causes and it’s easy to leave the cooking unattended if the phone goes or the doorbell rings, when we’re being distracted by children, family or friends, the TV or even whilst we do other jobs around the home. Alcohol can be great ingredient when used in a recipe. However, cooking after drinking alcohol increases your chances of having a fire. If you’ve had a few drinks and are feeling peckish get a takeaway instead. If you need to leave the cooking for a couple of minutes turn down the heat and set the timer or better still ask someone to watch it for you. Have a drink after you’ve finished cooking - alcohol lowers your concentration levels and the risk of accidents is greater in the kitchen if you have been drinking. Make sure saucepan handles are not sticking out from the hob or over a naked flame. Don’t leave children alone in the kitchen, keep matches, lighters and saucepan handles out of reach of children and fit a safety catch on the oven door. Don’t use matches or lighters to light gas cookers. Spark devices are safer, these can be bought from hardware stores. Take care if you’re wearing loose clothing as it can catch fire easily. Remember to check that the oven or hob are switched off after you have finished cooking. Keep anything that can catch fire like away from your hob – like oven gloves, wooden utensils, food packaging, towels or curtains. Clean your oven, hob and toaster on a regular basis. A build-up of fat, crumbs or grease can easily catch fire. Don’t put anything that is made of metal or is metallic inside the microwave. If the oil starts to smoke it’s too hot. Turn of the heat and leave to cool. Kitchen fires can also start by being careless with appliances. Regularly check that the ventilation in your kitchen, like range hoods or fans is working properly and is not blocked up. This is especially important if you have a gas cooker in case any leaking gas builds up. Only have one plug in each socket. If you need more plugs than there are sockets, use a 'bar type' fuse adaptor. Keep the total amps of all plugs in the adaptor to 13 amps or less. Remember that higher-amp appliances such as washing machines always need a socket to themselves. Don’t throw water on it. If it is safe to do so, you may be able to put out the fire immediately by pulling out the plug for the appliance or switching off the power at the fuse box.